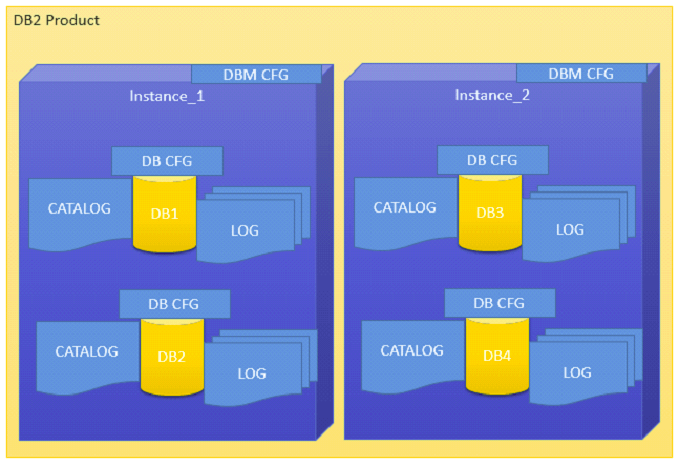 A DB2 instance is a logical Database Manager environment for DB2. It is used to manage databases. You can create multiple instances according to your requirements. The default instanceor for DB2 Database Server is "DB2". You cannot change the location of Instance directory after its creation. An instance can manage multiple databases. In an instance, each database has a unique name, its own set of catalog tables, configurations files, authorities and privileges. Note: You can create multiple instances in one DB2Server on Linux, UNIX and Windows. You can also install multiple DB2Servers on a physical machine. If DB2 Server is installed as root user then you can create multiple instances on Linux and UNIX. An instance can run simultaneously on Linux and UNIX independently. You can work within a single instance of the database manager at a time. An Instance folder contains database configuration files and folders. The Instance directory is stored at different locations on Windows depending on the operating system versions. db2ilist command is used to list the all the instances that are available on a system. db2 get instance command is used to see details of the currently running instances. If you want to start or stop the database manager of an instance on DB2 UDB, the following command is executed for the current instance. db2start command is used to start an instance. Before this, you need to run "set instance". db2stop command is used to stop the running instance. To create a new instance, you have to log in with root. Instance id is not a root id or a root name. Follow the following steps to create a new instance. Step2: Go to the DB2 instance directory in root user for create new instance. db2iupdt command is used to update the existing instance within the same version release. Before executing this command, you need to stop the instance database manager using "db2stop" command. The syntax below "inst_name" indicates the previous released or installed db2 server instance name, which you want to update to newer release or installed db2 server version. Command to find out which DB2 instance we are working on now.